Once available at a rate of ten a penny, side scrolling fighting games have virtually disappeared in more recent years, as gaming budgets increase and trends die away. Raging Justice is here to remind everyone that these games can still pack a hefty punch when it comes to whittling away an afternoon or two. 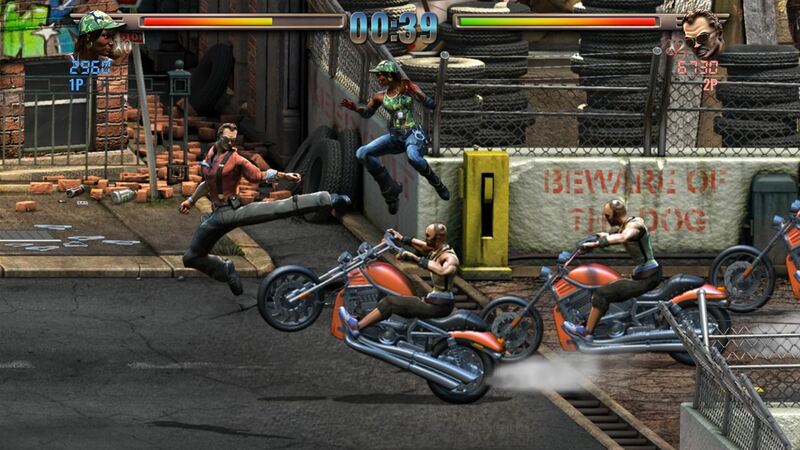 Players take control of one of three characters: Rick Justice – a cop that tends to punch first and ask questions later; Nikki Rage – another cop who has the highest conviction record on the force; or Ashley King – a teenager who has developed a fast and lethal style on the streets of Big Smoke City. There isn’t much difference between the characters and their attributes, so the choice is purely a cosmetic one. And despite there being the option of three characters, local co-op play only allows a maximum of two players and there is no online multiplayer at all to speak of. Leaderboards are present to compare and contrast on each level however. Raging Justice has a story, but it is paper-thin. This is a good thing though, as it means you get to the fist-flying action all that quicker. But in a nutshell, the mayor has been kidnapped, and the team are on their way to rescue him but get ambushed en route and must instead fight their way through streets, bars and amusement parks. And a circus. The flow of the levels do not fit together in the slightest as you can be fighting goons in the circus one minute, then waltzing through private gardens the next, but the visuals of the different locations help remove any monotony. 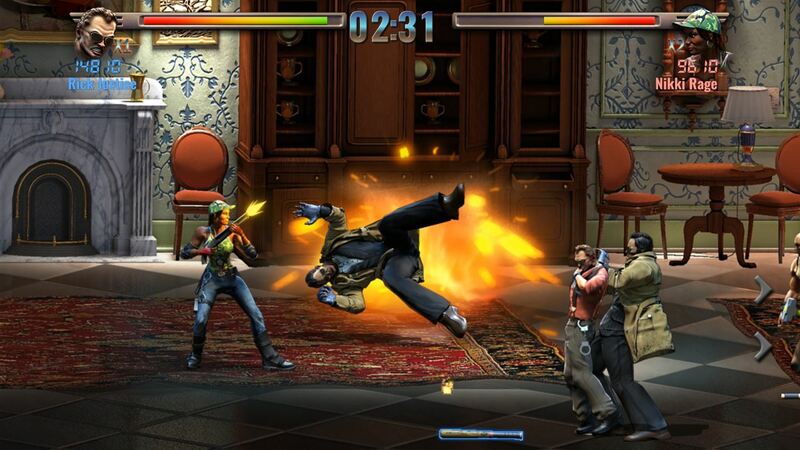 Raging Justice is – unapologetically – a side-scrolling beat ‘em up that isn’t afraid to copy almost everything from Streets of Rage, Final Fight and other such classics. It has the same variety of thugs – big, bigger, biggest – the same movement around the screen, big boss health bars, and even roast chicken health pickups. It isn’t a complete clone mind and there are some big differences to separate it from its inspirations to bring it more in line with modern games. The biggest new feature being that of a morality system in which you can arrest stunned enemies and earn a ‘Good Cop’ rating. Each level has several featured enemies that you can choose to arrest and in doing so, each arrested enemy drops food to boost your health. It’s a great feature but can be hit and miss in its execution as you need to rely on the target enemy going into a dazed state – something which doesn’t happen as often as you would hope for. Conversely, if you choose to hit one of these enemies with a weapon, you will earn a ‘Bad Cop’ rating instead, and these downed enemies drop items to confiscate and give your score a nice boost. 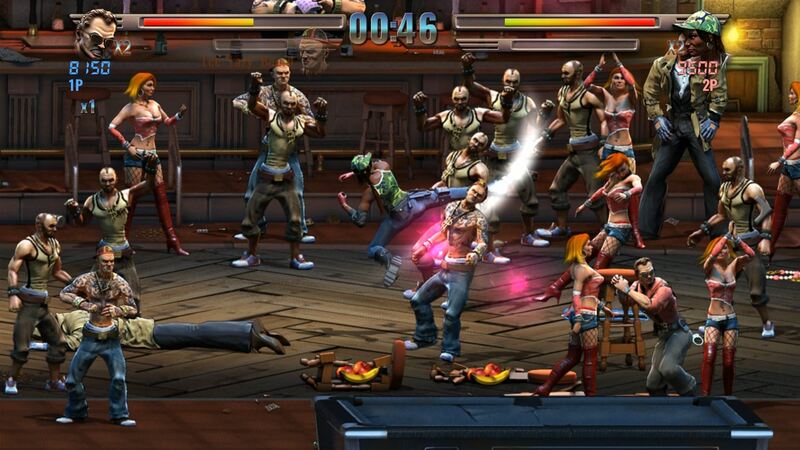 Other features include challenges for each level, and the Brawl mode. Brawl has you fight on maps from the main game against wave after wave of enemies, each getting progressively harder. This mode though doesn’t offer any additional excitement that the main game brings. It does retain the special attacks feature, but rather than build up a special meter for these, they can be dished out at any time. However, these now come at a cost to your health as you lose a chunk of it each time you use your ability. This in turn presents a risk/reward mechanic which will make you think twice before unleashing those special attacks. The art style is unique, but at first glance will certainly put people off. It features a lot of crudely designed character models – that is meant in a nice way because the enemies aren’t meant to look friendly – but they are limited in their number. Each enemy is individually named by members of the community and has their own moves and attacks, but truth be told, one or two more variations would have helped improve the game immensely. The bosses offer some additional variation, but even then there is repetition in them with several popping up on more than one occasion. Raging Justice also has a movement system that is likely to divide opinions, especially those unfamiliar with the genre. It can feel clunky and again, basic. But for those that are familiar, it feels just like you remember with player legs moving forward as you strafe up and down the screen. It actually looks harder to programme this movement nowadays than it was back in the ’90s. There are nine levels in total, and each can be completed in less than ten minutes. In fact, there are challenges for completing most levels in less than six minutes. Thankfully then, the game is designed to be played repeatedly with the challenges and Achievements all indicating that, and there is enough fun in here to warrant the price tag of £9.99. Add to that the co-op element and this can be enjoyed again and again. As mentioned, the Achievements are a diverse bunch and for such a short game, 50 achievements in total should keep you busier than the game completion length suggests. There are those available for completing each level for the first time, using each weapon a set number of times, arresting each thug on each stage and then harder ones such as completing all the challenges on the hardest difficulty. 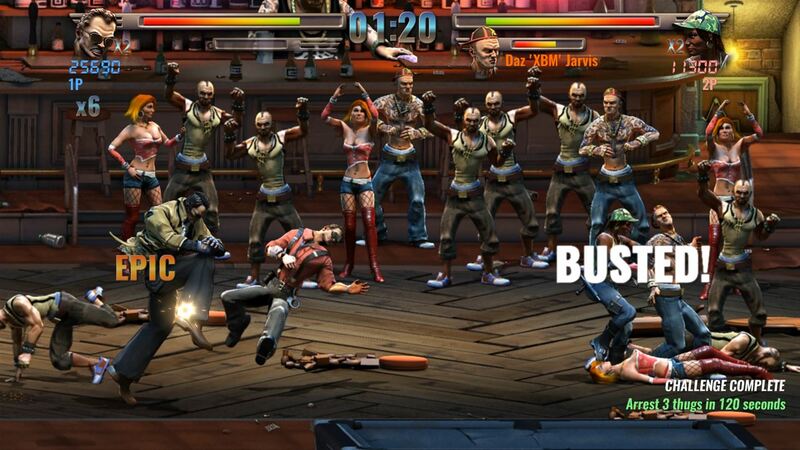 Raging Justice is a great addition to the beat ‘em up genre, and existing fans will enjoy the game hugely. It remains hugely faithful to the trendsetters of the genre – perhaps a little too much – yet has a couple of neat new features to separate it. The Good Cop/Bad Cop metagame ensures repeat playthroughs, and it is just as much fun in single player as it is in co-op. However even with the new features, newcomers may find things a little basic and on the short side, but that is only because it has stayed true to its ancestors.